It's a week since Ofsted came for their monitoring visit and it's been a time to reflect. We're still waiting for their letter but although they identified areas we still need to work on like the quality of our practice and a focus on outcomes, we still have a lot to be proud about. We now need a relentless focus on improving the quality of our casework. We had already identified those areas as something we needed to work on and they form a clear part of our vision and transformation programme. The recent care leavers celebration made me proud to work in Coventry. It was inspiring to hear from our young people about what they had been through but more importantly what they had achieved. I'm also arranging some more regular briefing sessions starting in the new year to help us keep in touch and up to date with what's happening across the service. I look forward to seeing you there. Coventry’s care leavers were celebrated in a ceremony honouring their achievements and successes last month. 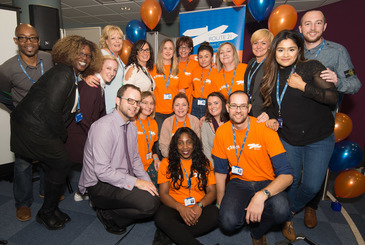 The care leavers celebration event was jointly organised by the Route 21 Team and the Participation Team. Coventry City Council is planning to consult on changes to how it provides residential care for children and young people in the city. The Council currently provides care for up to 12 children at two Council run children’s homes at The Grange and Gravel Hill. Under the new proposal, the Council would look to replace the existing provision at The Grange and Gravel Hill with four homes, providing up to four places in each home. The new proposal will help save money, provide more places and give young people cared for by the Council a placement more like everyday family living. There is a new Paediatric Sexual Assault Service for the West Midlands. If you need to refer someone you can call 0800 953 4131 or send a secure email pSASWestMids@uk.g4s.com.cjsm.net. You can find out more at www.bhamcommunity.nhs.uk/PSAS. The annual Christmas party for Looked After Children is currently being organised, and the team is looking for your help. The party is for children aged 12 and under. Father Christmas attends the party and provides presents for all the children. However, he still needs some more presents and he suggests we ask you kind people of Coventry City Council for donations. Legal Services, in partnership with the Permanency Team and the court service, have produced a video aimed at young people who are the subject of care proceedings. The video features three young people, who were themselves the subject of care proceedings, asking two senior judges questions about the process and their role. Social workers may find this a really useful tool to understand the questions young people have, or to show to the children and young people they are working with. Modern slavery is a serious crime in which people are exploited for little or no pay. Exploitation includes sexual exploitation, forced or bonded labour, forced criminality, domestic servitude and the removal of organs. We have a role to help spot and report it. You can find resources to help you on the Independent Anti-Slavery Commissioner's website and they have produced a short video to help you recognise the signs. Are your families affected by the benefit cap? Agencies in Coventry are explaining about changes to the benefit cap which will affect around 800 families in the city. From January 2017 families (both couples and single parents) who receive benefits totalling more than £384.62 per week will have money taken from their housing benefit – limiting the amount they can receive. Congratulations to Dianne Stevenson, Practice Development Team, who recently won an award for her work to embed Research in Practice in Coventry. Dianne is our Research in Practice Link Officer and the award recognises officers who have made an outstanding effort to support learning and development and to embed evidence-informed practice within their organisation. Diane said: "I was both delighted and surprised to find that I had won the silver Learning Champion award for embedding RIP resources into our Assessed and Supported Year in Employment (ASYE) programme." New guidance has been developed about sharing mobile phone numbers with service users and partners. You can read the guidance on Beacon. Positive Parenting, Youth Offending Service and the Police have organised a free session for parents and carers of teenagers which will give lots of information and ideas to manage behaviour and support children's development. Contact Positive Parenting on 024 7678 6949 to book a place or for more information. More than 170 children and adults enjoyed a range of fun activities at the recent Adoption Fun day. Adopted children and their families from across Coventry and Warwickshire got together for the event which is now in its eleventh year. Activities included biscuit making, henna art, planting bulbs, arts and crafts, face painting and drumming workshops. For the adults it was a chance to catch-up with other adopters, friends and Adoption Team workers. Don’t gamble that you know what you’re doing to keep people’s data safe and secure. Complete the new short e-learning course and make sure you’re up to speed with what you need to do. There will also be a one day course on drafting and court processes on the 7 March 2017. This is not linked to the other course, and can be attended on its own. 34 children have been adopted, 41 children are placed for adoption, and 15 applications have been lodged with the court (since April 2016).